The new larger Fiat is still very small but somehow manages to have a giant-sized interior. Fiat has finally been having some success with its teeny little 500 microcar. But, you know, some people could really use back seats with their own doors and a little more storage space. Or how about lot more storage space? 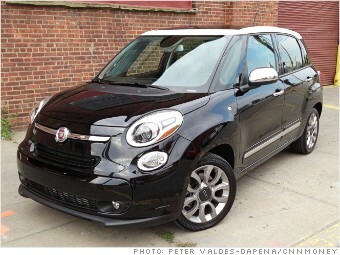 This is the the Fiat 500L -- L as in "large" -- and it's about 20% longer than the regular Fiat 500. What's amazing is that, with that extra two feet from bumper-to-bumper, Fiat designers crammed in over 40% more interior space. Besides more passenger room, it's got three times the luggage space. The name, by the way, is somewhat of a cheat. Even a casual glance will tell you that this car is not just a stretched out 500. It's a totally different model. And on top of all that room, the Fiat 500L also gets more power. I'm not about to tell you this car is fun to drive in any ordinary sense. With it's tall body and soft suspension, it bounces and wobbles like Jell-o on a lifeboat but, in its own funny way, it's pretty enjoyable.